Your fireplace could be a hazard, and the problems are hidden from view. You need to protect against blockages, smoke leaks, inadequate ventilation, insufficient draw, down-draught and tar build-up. 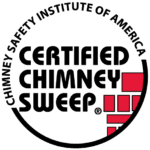 When did you last have the flue swept? Has it been tested for smoke integrity to ensure that no cracks or faults have developed? Are dangerous gases able to escape? A fireplace can be essential during the cold winter days, so at Patriot Chimney, we will make sure that your fireplace will not generate any damage as you spark it up during the winter.